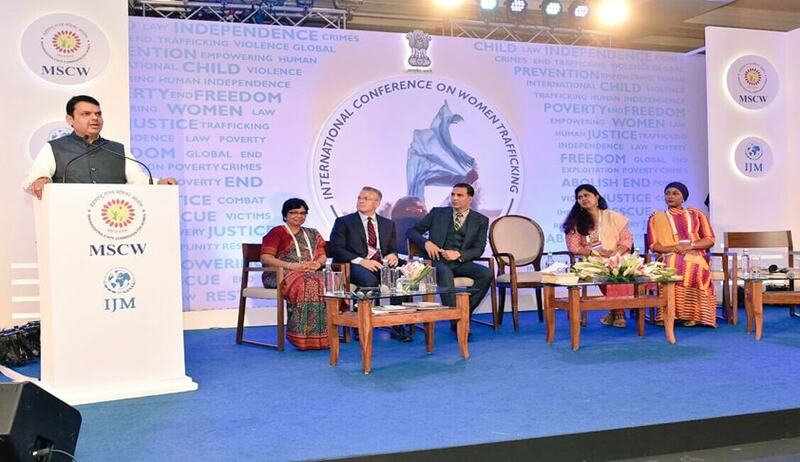 The two-day international conference on women trafficking held in Mumbai by the Maharashtra State Commission for Women (MSCW) in partnership with the International Justice Mission, India (IJM) concluded on Friday. There were many distinguished speakers at the event, including Chief Minister Devendra Fadnavis, State Minister for Women & Child Development Vijaya Rahatkar, who is also the MSCW chairperson; Second Lady of Ghana Hajia Samira Bawumia; and Global CEO of International Justice Mission (IJM) US Garry Hague. “Human trafficking, especially of children, is a big menace for the society and the Maharashtra government has taken a slew of steps to deal with the issue. The cases of child trafficking have come down drastically in the state where special cells have been set up in the vulnerable districts to curb the menace,” CM Fadnavis said. The Chief Minister said special anti-human trafficking units have been constituted by the state in 12 vulnerable districts and special courts have been set up for speedy trial of trafficking cases. DGP Mathur also said, “We will soon have one anti-human trafficking unit in every district headed by a deputy superintendent of police. We need to book them for economic offences. Mumbai is the financial hub. Therefore, money is more, so demand is more." Speaking on the second day of the conference, retired IPS officer and currently Professor at Tata Institute of Social Sciences (TISS) PM Nair, who has served National Human Rights Commission (NHRC) as nodal officer on anti-human trafficking and the principal researcher on the Action Research on Trafficking in Women and Children, strongly advocated for prosecution of traffickers, observing that most of the real perpetrators, who are the source of trafficking, are not prosecuted. Nair also said legalisation of prostitution would mean legalisation of trafficking. Last year, 19,223 women and children were trafficked as against 15,448 in 2015. While such strong support is being extended towards eradication of human trafficking from both the state government as well as the international community, a look at the petition filed in the High Court of Bombay by two survivors of human trafficking is warranted. One of the petitioners was trafficked as a minor, and she was rescued the same year. But the other petitioner was subjected to commercial sexual exploitation for six years. The petition states that no case was registered against the traffickers; consequently, no arrests were made even though specific names are provided. It is contended that only brothel managers are arrested and charge-sheeted but no case is made out against the trafficker and transporter who play a major role in trafficking. The petition alleged that the police shows complete disregard in registration and investigation of human trafficking under Section 370 (buying or disposing of any person as a slave/trafficking of persons), 372 (selling minor for purposes of prostitution) of Indian Penal Code and in almost all the cases related to inter-state human trafficking, no investigation is carried out to find out offenders from other states. The PIL also highlights a failure on part of the state in taking steps to come into an understanding with other states and union territories for co-operation in investigation and prosecution of cases of inter-state human trafficking. As per the government record mentioned in the PIL, about 3.25 lakh children have been reported missing between 2011 and 2014, out of which nearly 2 lakh were girls. According to National Crime Bureau Record data in 2013, total number of cases of human trafficking registered in India was at 3,940, in 2014 an increase of 38.7% took place (5,466 cases) and in 2015 number of cases registered was 6,877. Although, this PIL is still pending, the issues discussed at the conference were very similar to what the petition highlights and the major takeaway is a need for prosecution of traffickers who are the root cause and source of this menace.